Heat oven to 350°F. Spray 13x9-inch pan with nonstick cooking spray. Lightly spoon flour into measuring cup; level off. In large bowl, combine flour and remaining crust ingredients; with pastry blender or fork, mix until crumbly. Press mixture evenly in bottom of sprayed pan. Bake at 350°F. for 15 minutes. Remove pan from oven. Drizzle melted jelly over partially baked crust; carefully spread evenly. In large bowl, beat eggs. Add all remaining filling ingredients; mix well. Pour over warm crust. Return to oven; bake an additional 20 to 28 minutes or until top is light golden brown and center is set. Cool 1 hour or until completely cooled. Cut into 30 squares. In small bowl, combine 1/2 cup powdered sugar, almond extract and enough milk for desired consistency. Spoon about 1/4 teaspoon topping mixture in center of each bar. Top each with raspberry. Refrigerate until serving time. Store in refrigerator. To warm raspberry jelly in the microwave, cook on HIGH for 30 to 45 seconds. 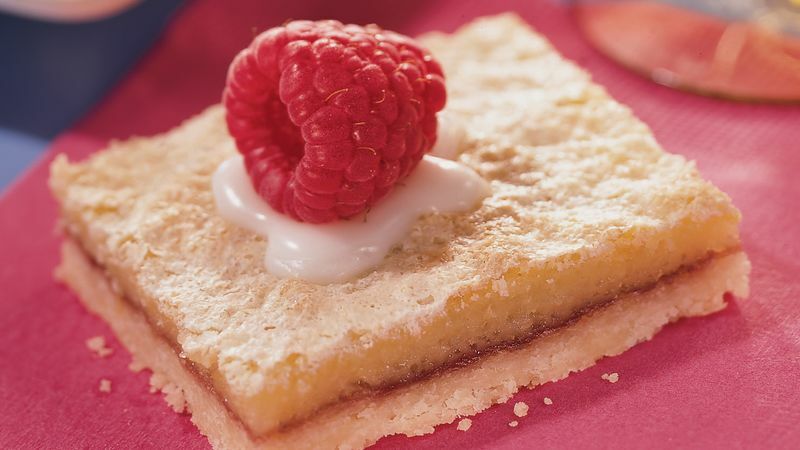 Bars topped with fresh raspberries should be eaten within one day because the delicate berries do not keep longer. When you anticipate serving only part of this recipe, ad fresh berries to the number of bars you will use. The extra bars without fresh fruit can be wrapped and refrigerated or frozen for another day.